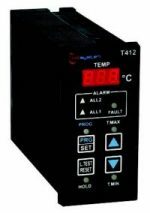 The T412 temperature controller is a single input temperature controller that provides plenty of features for monitoring a single hot spot. The input can interface with a RTD Pt100 sensor as standard but has the option for using a Tck thermocouple depending on your sensor preference. The input is protected from electromagnetic interference for consistent, reliable performance. The outputs consist of 3 relays; 2 alarm relays for different trip thresholds and another fault relay for signaling a sensor fault or a self diagnostic fault on the PC board.